In case you hadn’t noticed, my iPhone is full of Canadian artists and Feist is one of them. 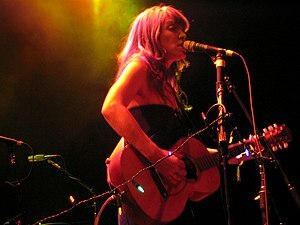 Calgary‘s own Leslie Feist had a major hit back in 2007 with her album “The Reminder“. It contained her major hit “1234” which had a life of its own after being used in an Apple iPod Nano commercial and on Sesame Street. I mean, how big are you when you get to sing a duet with Elmo. Feist has also got an extensive filmography and is also a regular member of the indie group “Broken Social Scene”, who are also worth a listen. This song, “I Feel It All”, was also on the album and received extensive airplay in Canada. It was also featured in the movie “The Accidental Husband”. Great album. Great song. This entry was posted in Adult Alternative, Canadian Music, Indie Music, Indie Rock, Music, Song Of The Day and tagged Elmo, Feist, Music, Reminder, Sesame Street. Bookmark the permalink. Honestly, I have 2 other albums, and neither is even close to the skills displayed on this one. She’s at our folk festival this weekend! Of course! It’s the best weekend of the year here! Saskatchewan weekends….miss them. Get one in a few weeks though, wedding PA followed by a day at Candle. Hope weather is great. nice. love that area… enjoy! I love this song! I think if I had to pick a theme song this would be it. Reblogged this on kitchenspinster's Blog. Passed along your info to MarkMyWords – he likes music & I think he would be a fan.